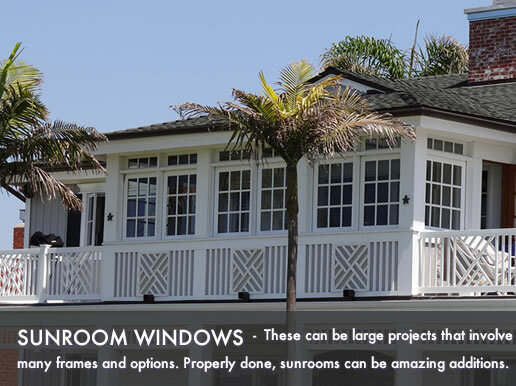 Sunroom windows costs and prices vary dramatically depending on whether you are replacing only the windows themselves or are actually building out a sunroom. On average, a sunroom will use between five and twenty windows - for a project that uses 10 windows fully installed you can expect a cost of anywhere from $1,850 to $10,000. Below is a general idea of what previous owners have paid for these windows to give you an idea on what you can expect to pay. Entry level prices go up to around $250 for each frame installed. This includes a low to mid level vinyl extrusion with limited options and color choices. You can expect a very basic glass package, it will probably include a low-E glass without any of the added extras. In many cases, these windows are what is called fixed windows, which means they do not open or slide. Mid range prices average around $350 for each frame installed. There are a number of frame options including aluminium, vinyl, uPVC and composite. You can expect a middle range glass package with low-E glass, standard hardware and upgrades. Normally these windows are fixed frames although they may include several single or double hung windows which can open to allow air flow. Higher end prices usually reach up to $750 for each window. The frames are normally fiberglass, solid wood, aluminium clad or even a steel made by a well-known manufacturer. The glass package is also high end made with double or triple paned glass with foam insulation, uv coating and a krypton fill. There are normally a choice when it comes to these style, including awnings or casement windows to allow for improved air flow. Cost to install these windows can vary between $600 and $2,500 for ten windows depending on the installation. A basic replacement will cost considerably less than if the window needs extensive work such as prep work, frame modifications or the frames need to be mulled together. Our replacement window price estimator can provide great cost estimates. Buget window pricing for a 10 window replacement project starts at $1,850 and tops out at $3,500. Standard window pricing for a 10 window replacement project starts at $3,500 and tops out at $7,500. High end window pricing for a 10 window replacement project starts at $7,500 and tops out at $10,000.